It’s the Guy Fawkes issue, and it’s Sadie in Waiting who does the honours. Poor Grovel is still in the doghouse after the Halloween fiasco he unwittingly caused last issue. Princess Bee won’t let him attend her fireworks display, but she would have been better off doing so. Grovel decides to have his own fireworks display – which messes up Princess Bee’s! It’s the last episode of “Miranda’s Magic Dragon”. Miranda puts all the mixed-up magic right after she finally figures out how the magic pendant works – it only works as it should when the intention is good; otherwise things go wrong for the person using it. Pity nobody told Mordac that; he finds out the hard way when Miranda deliberately lets him have it, knowing full well that his intentions will be anything but good. It’s his downfall, of course. “Atchoo!” starts today. You have to decide whether this one is a completely bonkers story or just plain silly. A weedy girl, Jenny Jeckyll, finds herself turning into a completely different and confident person – Hannah Hyde – after accidentally receiving a dose of her father’s new compound that can turn weeds into roses. The change occurs when Jenny sneezes, and another sneeze changes her back. Mr Evans has gotten mixed up with a bunch of rabbits that look just like him. As a result, Jenny now has the wrong rabbit! It’s now official in “Stairway to the Stars” – the council is closing the school down, in one fortnight. The pupils decide they might as well put on their end-of-term show on now then. A surprise turn of events has this turning it into their one chance to keep the school open – by performing it in front of the council. The trouble is, they have only one fortnight to get ready for a performance that was meant to take three months to prepare. Allgold’s manages to catch up to the Farthings despite the distance they put between him and them. Then grandfather’s power takes a hand and birds attack Allgold’s flunkies. Bird power is also taking a hand in “Ring of Feathers”. The birds help Cheryl to reassemble the real deed her uncle tore up and prove the one he has is a fake. Now Cheryl is racing against her uncle and pouring rain to get the deed to the expert in the village. Ever since #1, Princess had used selections of letters from her sister comic Girl for her letters page. From this issue she stops saying she is using Girl letters, so she must have been receiving enough letters to start printing her own. It’s the Halloween issue, but only Sadie in Waiting honours it. Princess Bee is hosting a fancy dress party for Halloween. Grovel is grumbling because he hates Halloween. He hates it even more after he mistakenly attacks Princess Bee (dressed as a gorilla) as SuperGrovel and does mountains of washing up as a punishment. “Their Darling Daughter” is the cover story, probably because this is the final episode, making it the second to be ejected from Princess’s first lineup. For some reason the title has ellipsis points, which it did not have in the other episodes. Perhaps it’s because of how everything resolves. Up until this point the impression was Mrs Crooks was plotting against Sylvie out of loyalty to the late Rachel. But then Sylvie finds out the real reason: Rachel was really Mrs Crooks’ daughter and Sylvie is really the Townes’ daughter. Mrs Crooks had switched them at birth so Rachel would lead an aristocratic life. Once discovered, Mrs Crooks goes fully insane and sets out to burn the whole house down while taking herself and the bound and gagged Sylvie in it! In “Mr Evans the Talking Rabbit” Dad’s too overcome with grief over his wife to do a show. Jenny calls upon Mr Evans to help out, but he refuses to do so after the bad experience he had with the other children who captured him after he became a rabbit. Nasty Uncle John has stolen Cheryl’s ring of feathers, but a bird friend helps her to get it back. She has also discovered Uncle John’s whole plan to destroy the woodlands, and only the ring of feathers can help her stop it. Meanwhile, Mum is hospitalised because Uncle John worked her too hard. “Farthings’ Flight” starts, and it is Princess’s first period story, set in Victorian times. We meet Lizzie Farthing, whose grandfather has a power over animals and birds. Silas Allgold discovers grandfather’s power, and tries to force them into joining his freak show. Allgold is even going as far as to threaten violence against anyone who employs or shelters the Farthings, so they will have no choice but to crawl to him. Lizzie won’t give in to such blackmail, hence the flight of the Farthings, but how far will they get from Allgold? He looks extremely determined to get them, and he has the money and heavies to back him up. In “Miranda’s Magic Dragon”, Liz is thrilled to meet King Arthur in person, but then the evil Mordac captures her. Meanwhile, a hint is dropped before Miranda that Paula has stolen her magic pendant, but will Miranda catch on? In “Stairway to the Stars”, poor Terry is expelled after getting in a fight with bullies who call him “cissy”. But after intervention from Sandy, Terry’s father, who had disapproved of Terry attending stage school, changes his mind about it so much that he persuades the school to reinstate Terry. The second issue of Princess II comes with a princess happiness ring. “The Incredible Shrinking Girl!” leads off the cover this time. Clare has now shrunk down to doll size. The parents take her to hospital, but now a media circus is outside to take advantage of the huge story. The parents allow them to do so, despite Clare’s protests that she does not want to be treated like a freak. The parents say they need the money the press is offering for Clare’s treatment – well, that’s what they say, but we suspect greed is overtaking them, and they don’t care for Clare’s feelings. For some reason they dropped the exclamation mark in the title for “Mr Evans the Talking Rabbit” that appeared in part one. The rabbit explains to Jenny that he is Mr Evans, the owner of the local joke shop. He was trying out a book of spells, but it backfired and he turned himself into a rabbit. Obviously, the consequences of meddling with magic when you don’t know what you’re doing. Miranda doesn’t fully know what she’s doing with magic either, although she is the granddaughter of Merlin. She’s unwittingly whisked herself from the days of Camelot into the year 1983, but at least she’s found a friend and guide to help her with the time and culture shock. However, the evil Mordac is not far behind and has sent his unfortunate-looking servant, in the form of a raven, to 1983 to steal the “magic dragon” pendant from her. In “Ring of Feathers”, Cheryl Gibson is finding misery at her new school as well as at home with abusive Uncle John. The class bullies are picking on her and for this reason nobody dares to be friends with her except one girl – and the birds that seem to be hanging around her ever since she acquired the ring. After the birds teach the bullies a lesson, Cheryl finally begins to suspect something funny is going on. A bully is out for a punishment in “Stairway to the Stars” as well. Linda picks on new girl Sandy, but Sandy finds some friends to help her punish Linda. They’ve tricked Linda into signing a document saying what a conceited pain in the neck she is, and they’re going to put it up on the notice board (hee, hee!). In “Their Darling Daughter”, Mrs Crooks suddenly becomes all apologetic and friendly to Sylvie, saying she didn’t mean those threats to get rid of her and it was the grief from Rachel’s death. But then it looks suspiciously like Mrs Crooks has tricked Sylvie into selling two pieces of porcelain that could get her into a lot of trouble with Lady Towne. 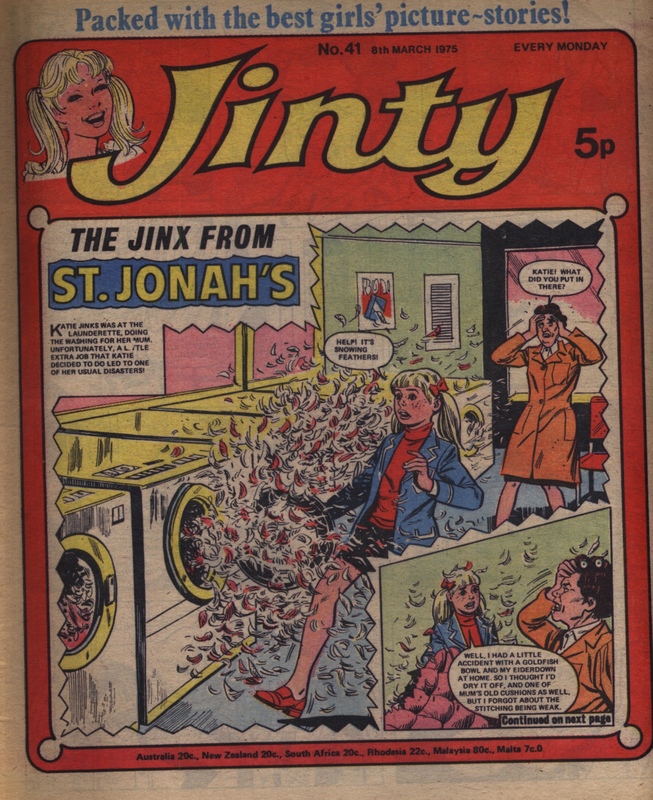 We start the Jinty blog entries for 2018 with the first issue of Princess, which I was fortunate to find while on holiday. No, not the Princess that later became Princess Tina. 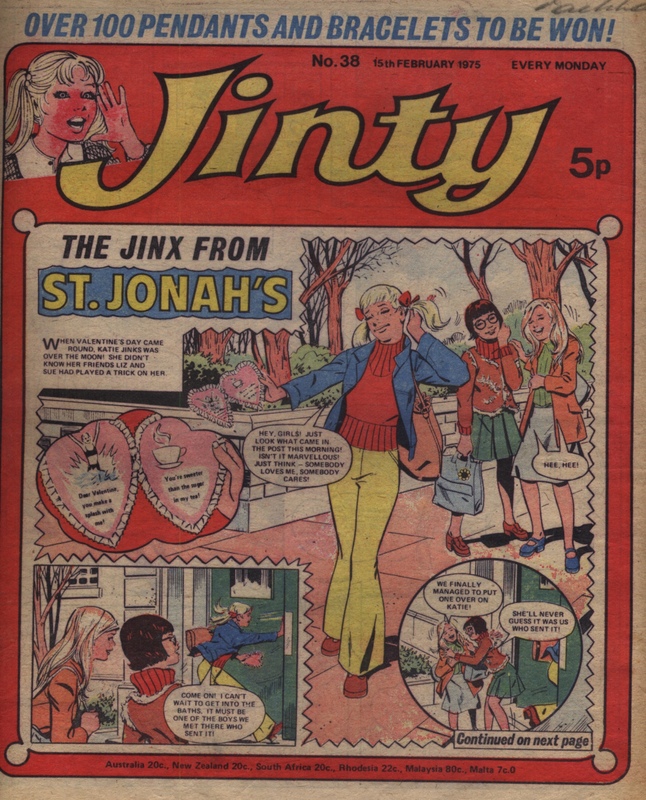 This is the start of the second Princess series, which used Princess Diana pictures and life story to sell the comic – sadly, not enough, because it merged into Tammy after 28 issues. Although Tammy was the title Princess II merged into, she started off as calling herself a sister comic to Girl II, IPC’s photo story comic. Indeed, Princess II was the same type of comic as Girl II, including the same newsprint and page size. She had her own photo stories, though she only ran two at a time, so there was more room for picture stories. There were also more colour pages, which must have made her more attractive to buy. One photo story was in full colour while the other was black-and-white, while the photo stories in Girl were all black and white. Later in her run Princess II switched to the same newsprint and style as Tammy and dropped the photo stories altogether. This must have been why Princess II merged with Tammy instead of her sister comic. In fact, the letters page of Princess II used letters from Girl as she had not received any of her own yet. The winning letter was the one that made sulky old Grovel grin. Readers must have wondered who Grovel was as they did not see his strip, the resident cartoon strip “Sadie in Waiting”, until the last page. Grovel is the villainous (but humorously so) butler of the piece. Grovel is alway sucking up to his employer, Princess Bee (hence his name), and is a bully and a schemer into the bargain, but Sadie the maid was always on the alert to his game. Princess Bee doesn’t think much of his grovelling either, so we have to wonder how on earth he holds onto his job. I wonder if this cartoon drew inspiration from Molly Mills in Tammy. The first story, which starts off on the cover, is “Ring of Feathers”. Cheryl and her mother move to Scotland to live with Uncle John. He soon makes it clear to them that he’s a mean type, and we’re soon getting hints that he is criminal as well. Meanwhile, birds have been hanging around Cheryl in an odd manner ever since she was given a ring of feathers as a parting gift. The first photo story, “Mr Evans the Talking Rabbit!”, is the one that appears in colour, and unlike most photo stories it has been remembered. Mr Andrews has lost heart as a kids’ entertainer ever since his wife died, which is not bringing in money for the rent and they’re on the verge of being evicted. While out on an entertainment job, daughter Jenny is very surprised to encounter a caged rabbit that can talk, and it doesn’t appear to be her father’s ventriloquism. But we don’t find out what’s going on until next week. In “Their Darling Daughter”, Lord and Lady Towne foster Sylvie, a girl in a children’s home, while still grieving for their daughter Rachel. There’s some mystery as to how they actually came across Sylvie and why they fostered her, but there’s one person who is determined to get rid of her. No, it isn’t a spiteful stepsister or cousin, which is usually the case. It’s Mrs Crooks the housekeeper, who worshipped Rachel and doesn’t want anyone taking her place. Unlike most of these types of schemers, Mrs Crooks does not keep her campaign secret from her unsuspecting victim. She tells Sylvie straight off that she wants her out, and why. This story is also unusual for using Bert Hill, an artist who was seen frequently at DCT, but not at IPC. “Miranda’s Magic Dragon” is not a real dragon. It’s a magic dragon pendant that Merlin bequeathes to his granddaughter Miranda before he dies. Unfortunately Miranda has not got the hang of its magic yet, and her first disaster is to be transported from the days of Camelot into the year 1983. Talk about a fish out of water! Meanwhile, Merlin’s enemy Mordac is after the pendant, and we are getting hints that he is about to make his presence felt in 1983. Gee, what’s he going to make of that time period? Miranda has almost been hit by cars as well as culture and time shock. Oddly for a girls’ comic’s first lineup, there is no ballet story. Still, we get plenty of dancing in the second photo story, “Stairway to the Stars!”, which is the black-and-white photo story. It is set in a stage school and has a soap opera feel to it. So we get a school story into the bargain. Clare Humphreys is recruited to test a range of products. She feels it is unhealthy because they are so full of chemicals, but she does not realise how right she is until they start making her shrink. Towards the end we start seeing Princess Diana herself. It’s part one of her life story, and on the back cover we get the first Princess Diana pinup.